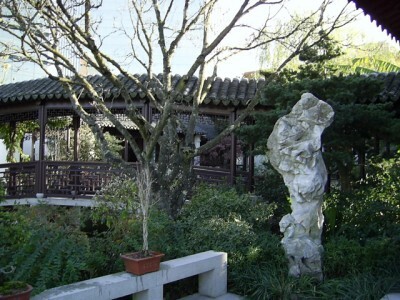 This is an installation perspective on Portland, Oregon’s Chinese Garden which last saw the light of day 8 years ago. I’ve edited and added a few things for this iteration, but the substance remains relatively unchanged. We pick things up at the “chain design” section, as we prepared to lift and lower the months worth of acquired plants and trees into their positions, some of which were simply gigantic. So John had the chain designed for our needs – we needed something that could handle the weight without snapping, obviously, while shuttling these massive hand-dug trees with gigantic root balls into their eventual homes. But we also needed something we could uncouple quickly, especially difficult considering the expanse involved: many of the root balls were up to eight feet across! Anyway, this was accomplished well. It turns out, we had learned, during a first hand tutorial at the surprisingly massive chain factory down the street of the wonders of the famous “Quick Coupler”. I pointed this small element out merely to indicate the unique problems besetting an enterprise like this. Imagine an entire city block and the numbers alone of mature trees needed to complete the look. Imagine as well a stationary crane grabbing these big suckers and then delivering them to the “holes”. The word is, the crane nearly toppled handling this huge Magnolia for a really far spot. 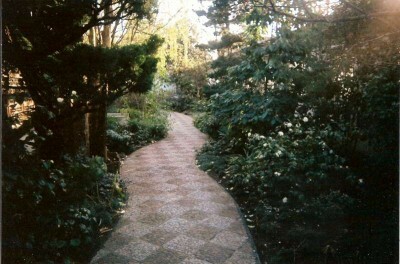 When we got there and actually commenced the work, it was early in the process. The project was basically a great open massive hole in the ground with pockets of formed concrete piers and foundations for things such as the buildings as well as support structures for bridges and walkways. Irrigating this mess was intense. We spent nearly a week just coring holes through all the foundations walls with a diamond drill to poke pipe through and deliver water throughout the entirety. Fortunately, the service was to be completely drip irrigation so the pipes required tended to be in the 2 inch range. We complete a complete enclosed circle, which was always the goal, and then fed off that to supply the valves and the nearly above ground piping. I hasten to add, we also had the unenviable and often nearly fruitless task of running the electrical wiring for these remote vales to tie into a central control clock. Why “nearly fruitless”? Because of the insane amount of construction yet to perform before the soil we supplied and introduced could supply the padding and insulation fro construction wear and tear. Those nasty things like boots of the workers, shovels and machinery is why, any of which could expose the copper wire by cutting through the plastic sheath and render it useless and an absolute bear to locate and fix – a common lament in irrigation circles. Indeed, it turned out we did lose a couple of wires by having them cut somewhere. The most fascinating part of the project for me was when the Chinese workers showed up. There was supposedly 150 involved, but I think that included a substantial corps of engineers and architects as well. The workers were fun and very easy to get along with. The fact that I smoked cigarettes turned me into a popular figure, lol. I swear, I believe they all smoked. Very James Bondish of them! But they were all easy to get along with, talented as heck, focused and extremely hard-working. It was a pure pleasure working next to them. 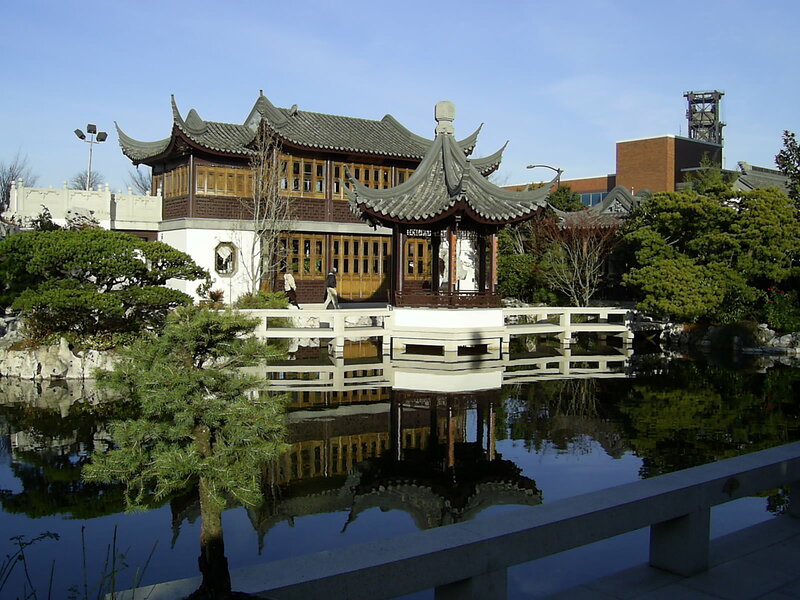 So many elements of this Garden were brought from China, it’s mind-blowing. Indeed, the bridges themselves were made of granite, hand-crafted back in China, many by the same guys who installed them here. Needless to say, the awesome rocks featured here were all delivered straight from China as well, including those composing the entire water feature and small mountain. 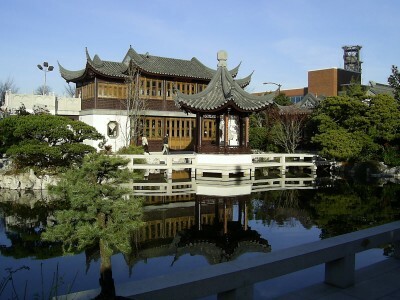 I have always wanted to visit this and the classic Chinese gardens in Suzhou. Thanks for the tour and interesting story. Absolutely, Philip. Obviously, I have a hankering to go over there now, myself. Heck, I even have contacts there now!